In resealable plastic food-storage bag, place cheeses and flour. Shake until cheese is coated with flour. Rub garlic on bottom and side of fondue pot, heavy saucepan or skillet; discard garlic. Add wine. Heat over simmer setting on fondue pot or over low heat just until bubbles rise to surface (do not boil). Stir in lemon juice. Gradually add cheese mixture, about 1/2 cup at a time, stirring constantly with wire whisk over low heat, until melted. Stir in kirsch. Keep warm over simmer setting. If prepared in saucepan or skillet, pour into a fondue pot or heatproof serving bowl and keep warm over low heat. Fondue must be served over heat to maintain its smooth, creamy texture. Spear bread and fruit with fondue forks; dip and swirl in fondue with stirring motion. If fondue becomes too thick, stir in 1/4 to 1/2 cup heated wine. Using wine to make fondue isn’t just French chic, it actually plays an important role in keeping a fondue smooth and creamy—it’s the acid that prevents clumping or the sauce from breaking. But a little lemon juice can do the same thing if you want to skip the wine. Keep the temp low under a fondue sauce, cheese doesn’t need high heat to melt. Tossing the shredded cheese with flour (or even cornstarch) is another step that helps keep the melting cheese silky smooth and dippable. If the fondue becomes too thick, stir in a little more wine. Chunks of a nice sourdough bread is a natural partner for fondue, but sliced apples, pears, and a bouquet of blanched vegetables will make a very satisfying meal. “Shareability” continues to increase in popularity as a home dining and restaurant trend. Diners want eating experiences that are fun, casual and interactive. Sitting around a fondue pot with friends is the ultimate “shareable” evening—an opportunity to enjoy each other’s company while communing together over delicious comfort food. Fondue is a dish that originated in Switzerland, where the earliest known recipe for "Käss mit Wein zu kochen" (translation: "to cook cheese with wine") was printed in a 1699 Zurich cookbook. The Swiss continue to promote the dish and its national importance. The motto "fondue isch guet und git e gueti luune" (translation: “fondue is good and creates a good mood") even has its own acronym: FIGUGEGL. 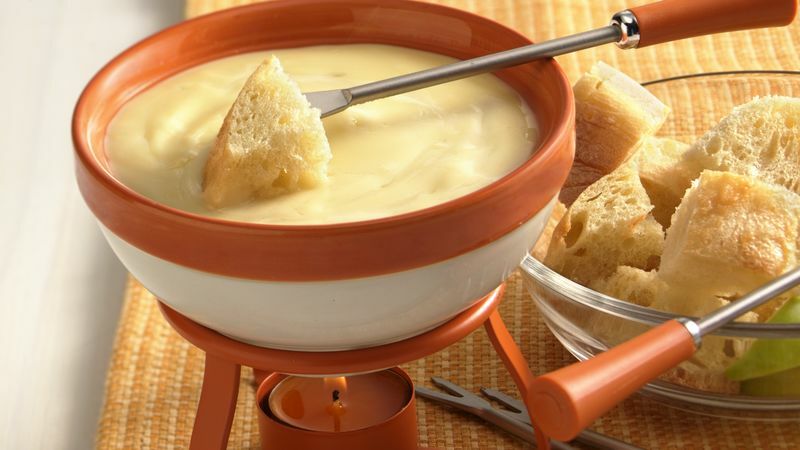 If you’ve found that cheese fondue has put you into an exceptionally good mood, consider dipping your long fondue fork into even more cheesy recipes from Betty Crocker.